Can't believe it's July already - the year is going by so quickly! Here's a couple little empties that I finally got through this month. Batiste Dry Shampoo - Love love love this stuff. Most mornings I'm pretty much made of coffee and dry shampoo! I love all the different scents as well - I grab a new one pretty much every time I repurchase. Hada Labo Shirojyun Milk* - My current night moisturiser. 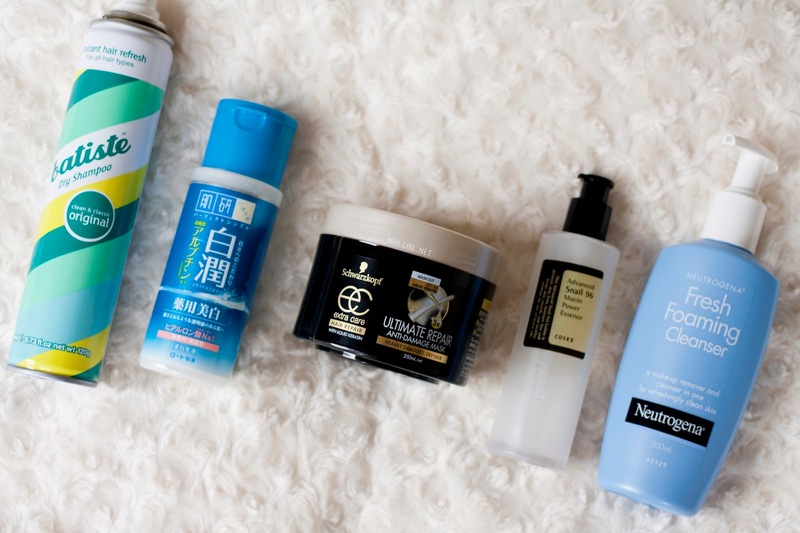 It layers really well with the Hada Labo toners I use, but is hydrating enough on it's own if I'm short for time and skip my toners. So moisturising and soothing! Have already repurchased. Schwarzkopf Ultimate Repair Mask - Combining this with coconut oil leaves my hair feeling so soft, silky, and nourished. I was having trouble with putting pure coconut oil in my hair (it wouldn't rinse out, no matter how many times I shampooed!) so I thought why not mix it with a treatment? This stuff is totally amazeballs for dry, bleached hair. Have already repurchased! CosRx Snail 96 Mucin Power Essence* - Probably my only 'meh' of the group. I bought this to see how well it would replace my much adored Benton Snail Bee High Content Essence. Short story - I only used it to use it up. It didn't make my skin worse, but I can't really say it made it better. It wasn't particularly soothing, didn't heal my pimples faster, or give me any kind of glow (all of which the Benton Essence did). Would not repurchase. Neutrogena Fresh Foaming Cleanser - Another essential repurchase. I'm frankly very boring when it comes to facial cleansers - I don't see any point in spending lots on something that's on my face for a short period of time. I also don't see any point in having actives in cleansers for the same reason! So this ticks all the boxes - cheap, easily available, and doesn't break me out. Have already repurchased! Do you spot any of your favourites here? Let me know!